Meta-evaluation of Dynamic Search: How Do Metrics Capture Topical Relevance, Diversity and User Effort? 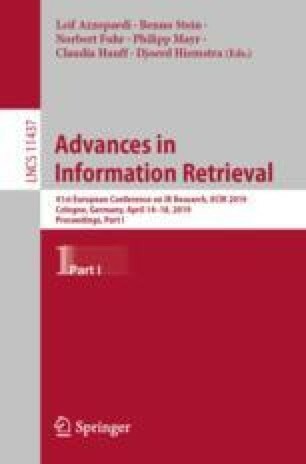 Complex dynamic search tasks typically involve multi-aspect information needs and repeated interactions with an information retrieval system. Various metrics have been proposed to evaluate dynamic search systems, including the Cube Test, Expected Utility, and Session Discounted Cumulative Gain. While these complex metrics attempt to measure overall system “goodness” based on a combination of dimensions – such as topical relevance, novelty, or user effort – it remains an open question how well each of the competing evaluation dimensions is reflected in the final score. To investigate this, we adapt two meta-analysis frameworks: the Intuitiveness Test and Metric Unanimity. This study is the first to apply these frameworks to the analysis of dynamic search metrics and also to study how well these two approaches agree with each other. Our analysis shows that the complex metrics differ markedly in the extent to which they reflect these dimensions, and also demonstrates that the behaviors of the metrics change as a session progresses. Finally, our investigation of the two meta-analysis frameworks demonstrates a high level of agreement between the two approaches. Our findings can help to inform the choice and design of appropriate metrics for the evaluation of dynamic search systems. This research was partially supported by Australian Research Council (projects LP130100563 and LP150100252), and Real Thing Entertainment Pty Ltd.